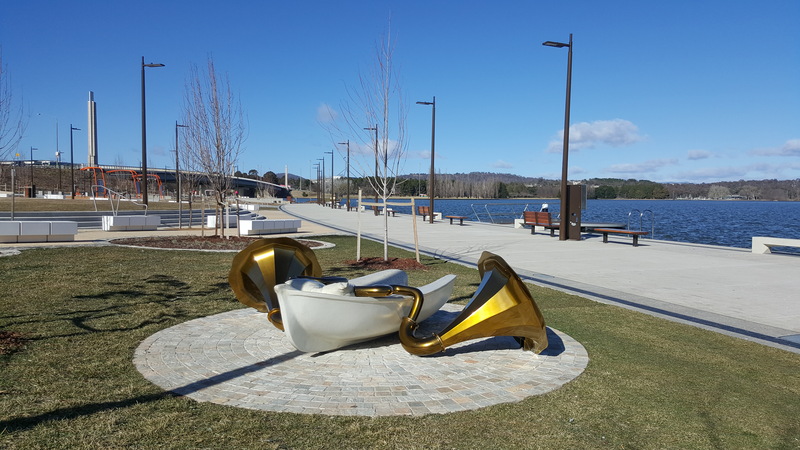 An interactive sculpture by prominent local artist Dr Hanna Hoyne has been installed at Henry Rolland Park, on the shore of Lake Burley Griffin. Crying Dinghy is part of Hanna Hoyne’s Cosmic Recharge series. Other artworks in the series have featured in Sydney’s Sculpture by the Sea and another at the University of Canberra. Dr Hoyne is a highly regarded artist, receiving the prestigious Helen Lempriere Award in 2016. The Cosmic Recharge sculptures invite people to imagine some part of their own interior lives by connecting their physical bodies to the object. “The Spirit Recharge Vessel Crying Dinghy is a kind of anti-hero work in the Cosmic Recharge series,” Hanna Hoyne said. As the City Renewal Authority continues to enliven the city’s urban environment; investment in local artistry, knowledge and creativity will continue to play an important role. A saddening act of vandalism and theft has occurred at West Basin’s Henry Rolland Park with an estimated $100 000 in damages inflicted on the community park. Brass materials have been stolen from the park’s facilities, and significant damage occurred as a result. Brass was removed from 26 benches, 21 bollards, three bins and two drinking fountains. It is a disappointing that someone would steal public assets and vandalise the park, created for the enjoyment of everyone. The City Renewal Authority is considering options to replace the stolen brass and restore the park. The crime has been reported to ACT Police. If anyone witnessed the crime or has any information that may assist, please contact ACT Police on 1800 333 000. The City Renewal Authority is today working on making the area safe for the community to continue enjoying the waterfront community park. The City Renewal Authority will begin lake bed testing next week as part of its design for the realignment of the West Basin shoreline for Stage 2 of the waterfront development. Works approval has been granted by the National Capital Authority (NCA) to undertake geotechnical investigations, to determine the depth of the sediment on the lake bed. This will assist with the foundation design required to construct the proposed 500m of boardwalk and new lake wall. Testing will take place from a floating barge in the lake over the next few weeks. The testing does not require drilling and will not disturb the lake bed. These results will inform the design phases for a further works approval application to the NCA for the next stage of work on the waterfront. These works will realign the West Basin shoreline so that it is consistent with the National Capital Plan. City Renewal Authority chief executive Malcolm Snow said a works approval application for stage two would be lodged once negotiations with the Australian Government on the transfer of part of the lake bed to the ACT Government had been resolved. “The redevelopment of West Basin into a more people-friendly area is a key objective for the City Renewal Authority,” Mr Snow said. “That’s why our priority is the creation of high-quality public spaces as the first stage of redevelopment. “Opening Henry Rolland Park has already transformed a bleak car park into a wonderful new public space for people to visit, spend time and connect with their community. “Stages two and three will complete the boardwalk and promenade at West Basin and will include a new urban park, play areas, public facilities and opportunities for cafes and restaurants. Stage two is planned to begin in early 2019 and will consist of another 500m of boardwalk and the reclamation of approximately 2.8 hectares of lake bed to realign the shoreline. West Basin is Designated Land and works approval from the NCA is required for all development work. All applications to the NCA will be subject to public consultation. Road access under Commonwealth Avenue Bridge between Henry Rolland Park and Commonwealth Park will be closed on Wednesday 30 May to allow for the installation of glass coverings on the barbeque shelters at Henry Rolland Park. Vehicle access during the closure will still be available to both West Basin (entry and exit northbound on Commonwealth Avenue) and to Commonwealth Park (exit and entry southbound on Commonwealth Avenue). Drivers wanting to access or exit these areas in the opposite direction will need to turn around at Vernon Circle to the north or via the Flynn Drive off-ramp at the southern end of Commonwealth Avenue Bridge. Pedestrians and cyclists will be able to use the boardwalk and footpath within Henry Rolland Park to traverse through this area. Detour signage and barriers will be in place to alert motorists to the closure and direct them to the diversion. Access under Commonwealth Avenue Bridge, through Henry Rolland Park, will return to a shared zone on Thursday 31 May. 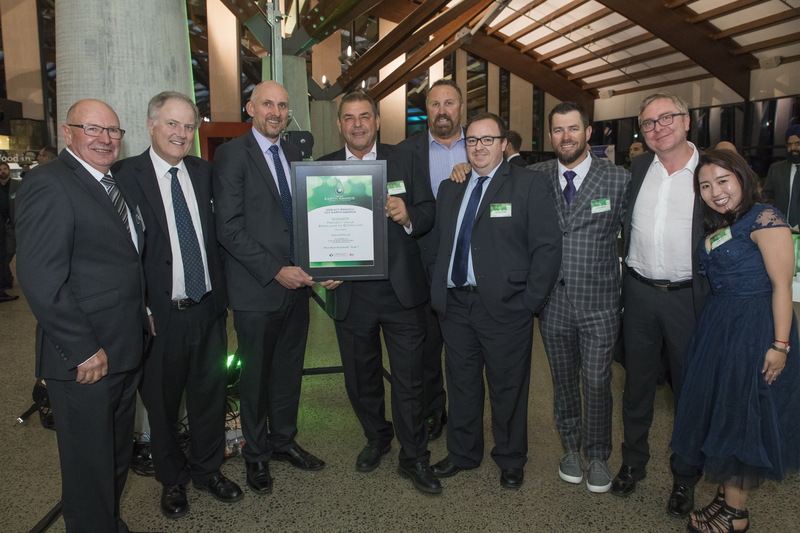 The new boardwalk at Henry Rolland Park has won a Civil Contractors Federation Earth Award for the best civil construction project between $5-$10 million in the ACT and surrounding region in 2017/18. The boardwalk is 8.1 metres wide and constructed of high-quality precast concrete, sourced from South Australia. 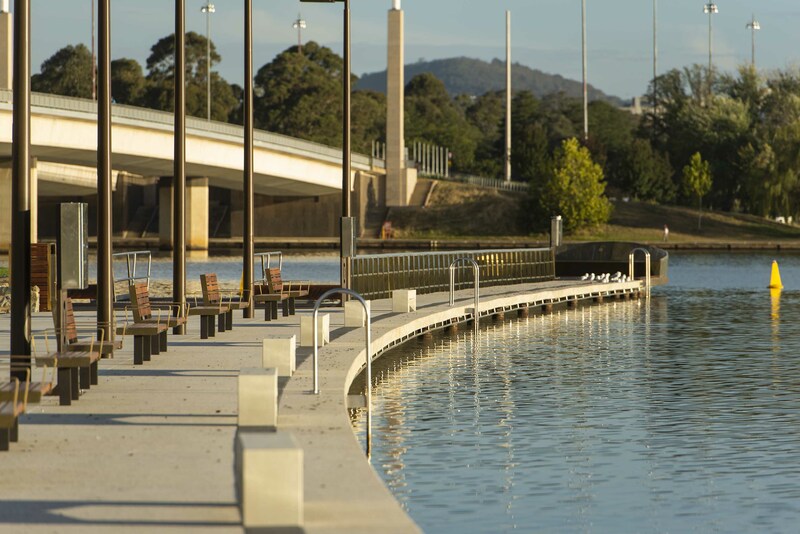 Timber is featured in the Griffin Marker light deck, kayak cove and round pontoon structures that extend into Lake Burley Griffin. Chincivil was hired as the contractor to deliver this project. The next stage of development in West Basin will see the boardwalk extend another 500 metres. The construction of the boardwalk is part of the City Renewal Authority’s upgrade of West Basin. Once complete, the area will be a premium recreation destination, for locals and visitors to enjoy. The boardwalk will now be considered for a Civil Contractors Federation National Award in November. View the photo gallery from the ACT region awards night here. The opening of Henry Rolland Park on Saturday 28 April 2018 was a significant milestone in the transformation of West Basin from a place for cars into a place for people. The revitalisation of the lake front closest to our city centre was a key government priority as the City Renewal Authority progresses plans to better connect the city to its best landscape feature. Thousands of people attended an opening day event that featured music, games, children’s activities, fitness classes and boat rides. 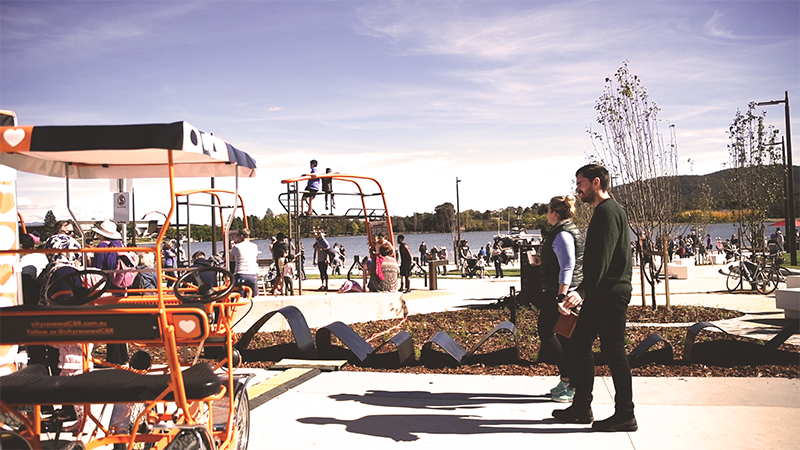 City Renewal Authority chief executive Malcolm Snow said the new $13 million park and boardwalk had turned what was primarily a bitumen car park into one of Canberra’s best new public spaces. “It was wonderful to see so many Canberrans using this new park,” Mr Snow said. “Henry Rolland Park is a fantastic new public space in the heart of the city for people to connect with each other while enjoying one of our best views. “The redevelopment of West Basin is an important project for our city. It will give us a vibrant and attractive water-front that is connected to our city centre. The redeveloped West Basin waterfront is being created as a place for people. That’s why the City Renewal Authority is building the public areas first. The upcoming stages of redevelopment will focus on the next 500m of boardwalk, lake reclamation and the public promenade. The opening day also featured a ceremony to honour Henry Maitland Rolland OBE. ACT Chief Minister Andrew Barr joined five of Henry Rolland’s grand children in unveiling a plaque in honour of the former Chief Architect in the Federal Capital Commission who played a significant role in the early development of the capital. “It was great today to see so many of Henry Rolland’s descendants in attendance on the park’s first day as a public space,” Mr Snow said. West Basin’s newest park, on the edge of Lake Burley Griffin, will officially open on Saturday 28 April - let’s celebrate! Join us from 10am to 4pm as we host a day out at Henry Rolland Park. There will be live music, activities and games to take part in, spectacles to see and food and beverages to enjoy. The opening of Henry Rolland Park marks the first stage of development in this area to deliver a more accessible and connected waterfront. The new park, which is connected to the lake by a 150m long boardwalk, has lawn areas, picnic and barbeque facilities, exercise equipment and more than 23,000 plants. 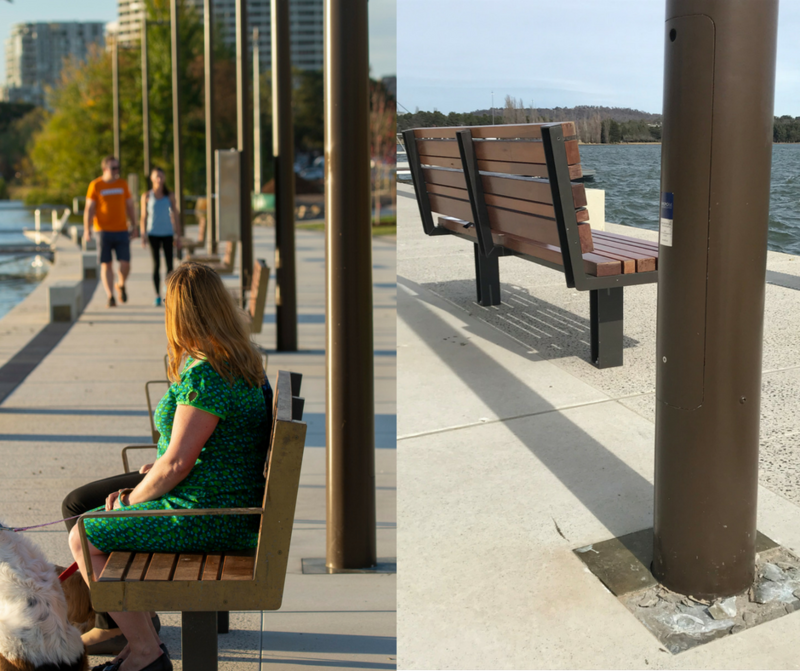 Come and enjoy a day at the lake and see Canberra’s newest park for yourself. Henry Rolland Park at West Basin will be open to the public from Saturday (28 April) and the City Renewal Authority is throwing a party to celebrate. The opening day event will run from 10am to 4pm and feature free live music, fitness classes, games and children’s activities that take advantage of the new park’s high-quality facilities. Food and drink vendors will be onsite with Lions BBQ, Capital Woodfire Pizza, Boss Burgers, coffee from Shot Clock and brownie sandwiches from Hungry Brown Cows. The Pop-Inn will also drop-in from noon and will operate until 6pm. 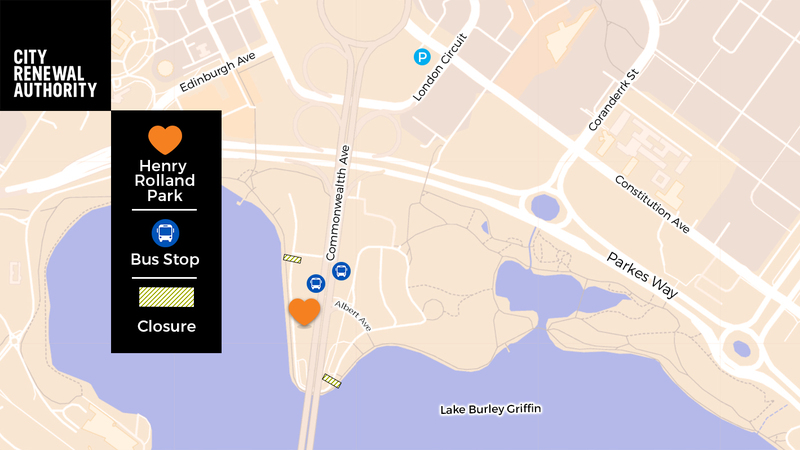 Several local businesses that make use of Lake Burley Griffin will also be operating from the park for the day. Go Boats will run short trips around West Basin for a gold coin donation and Canberra Urban Adventures will run their kayak and bike hire services from the park. City Renewal Authority chief executive Malcolm Snow said the opening day event would be the first opportunity for the community to experience the city centre’s newest park. “Henry Rolland Park is a wonderfully located place for people to get together and enjoy one of Canberra’s best views,” Mr Snow said. “The park has barbecue and picnic facilities, world-class outdoor fitness equipment, lawn areas to play or even just sit and relax. The park is also connected to a brand new 150m boardwalk that has two timber jetties and a wet dock for canoe and kayak access. “We invite all Canberrans to come down to the park on opening day to enjoy live music, take part in fun activities and see what the park has to offer. Henry Rolland Park is part of Stage 1 of the redevelopment of West Basin. It will be a major upgrade of the public area on a section of West Basin that was previously mostly surface car parking. This new flythrough video is an artist's impression of what the community can expect from the new park, which will open early in 2018. The architect tasked with overseeing the construction of early Canberra has topped a public poll to choose a name for the new public park at West Basin. Henry Maitland Rolland OBE was a resident architect in Canberra during 1912-16, working mainly on the construction of the Royal Military College, Duntroon. He was later the Chief Architect in the Federal Capital Commission, from 1925-27, tasked with overseeing the construction of the new city and its centrepiece, the provisional Parliament House. Henry Rolland Park collected 684 votes out of a total of 1495 votes received in the online poll held between 24 September and 27 October. The new public park at West Basin is currently under construction and is expected to be open early next year. A short video about Henry Maitland Rolland OBE can be viewed here. Part of the first stage of the ACT Government’s redevelopment of West Basin, the park will be a public asset that provides a recreation destination befitting its prime location on the Lake Burley Griffin foreshore. The park, and the recently constructed first 150m of boardwalk, significantly improve public access to an area that was previously mostly surface car parking. Stage two of the West Basin redevelopment will consist of 500m of boardwalk which will form part of a future generous 55m-wide public promenade. 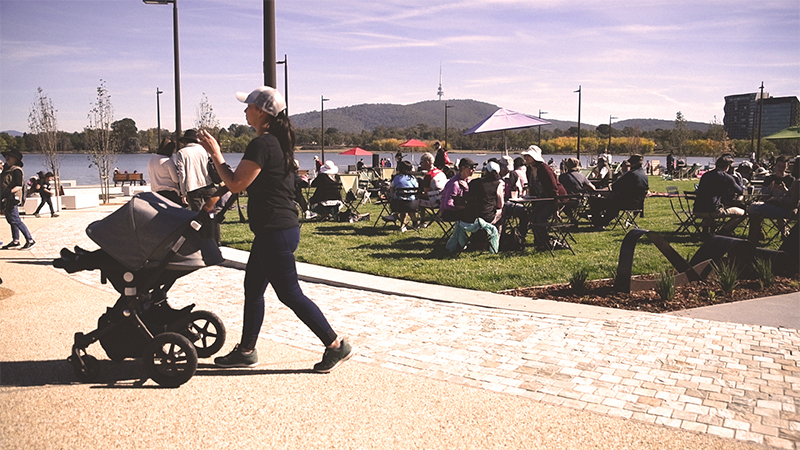 The four shortlisted names for the park were selected by the ACT Place Names Committee and reflected significant contributions to the development and growth of the Canberra region. The poll results will be provided to the committee, which will the make a recommendation to the ACT Government about the naming of the new park. The other three shortlisted candidates for the park name - John Gale (548 votes), Dame Sylvia Crowe (219 votes) and John McLoughlin (44 votes) - will still be considered by the ACT Place Names Committee for other naming honours opportunities as a way to commemorate their important legacies. For more information on the City Renewal Authority, the new public park or the development at West Basin visit cityrenewalcanberra.com.au or follow the authority on Facebook, Twitter or Instagram. The road under Commonwealth Avenue Bridge between West Basin and Commonwealth Park will be closed again from Monday 23 October until the new public park is completed in early 2018. The same section of Barrine Drive had been closed from June until just before Floriade, at which time it was temporarily re-opened as one-way road. With the high volume of traffic associated with Floriade now finished for another year the road will again be closed to allow completion of the new public park. Diversions will be in place to ensure continuous access to both Commonwealth Park and West Basin parking areas during the temporary closure, including during individual events taking place during that period. City Renewal Authority acting chief executive Nicholas Holt said both West Basin and Commonwealth Park would remain accessible to users during the closure but some diversions would be in place for drivers looking for access from the opposite sides of Commonwealth Avenue. “The temporary re-closure of this section of Barrine Drive allows for the continued construction of a new high-quality public park,” Mr Holt said. Pedestrians and cyclists will be able to use the signalised Commonwealth Avenue crossing. These diversions will be in place both day and night. Detour signage and barriers will be in place to alert motorists and pedestrians to the closure and direct them to the diversions. A convict turned land manager, a landscaper, an architect artist and the founder of The Queanbeyan Age are the four options being put to the community for the naming of the new public park at West Basin. City Renewal Authority chief executive Malcolm Snow encouraged people to visit the consultation page, find out more about the four nominees, and have input into the naming of a great new public space. “This new park is going to be a great public asset. This is a wonderful opportunity for the people who will use the park to have a say in choosing its name,” Mr Snow said. John McLoughlin Park – John McLoughlin arrived in Australia in 1811 after being found guilty of stealing two horses in his home country of Ireland. In 1824 McLoughlin was put in charge of 2000 acres, including what is now the site of the National Museum of Australia – the first recorded European grazing run on the Limestone Plains. He also established Canberry station, considered the first settlement by white people on the site of the future national capital. Henry Rolland Park – Henry Maitland Rolland OBE was a resident architect in Canberra during 1912-16 working mainly on the construction of the Royal Military College, Duntroon. He was the Chief Architect in the Federal Capital Commission from 1925-27 tasked with overseeing the construction of the new city of Canberra and its centrepiece, the provisional Parliament House. John Gale Park - John Gale’s advocacy for the Canberra area as the best site for the future federal capital earned him the colloquial title of ‘Father of Canberra’. He founded the first local newspaper The Golden Age in Queanbeyan in 1860. He served as District Coroner for the Federal Territory and Queanbeyan for many years and was the Member for Murrumbidgee in the NSW Legislative Assembly in 1887-1889. Voting will be open online at yoursay.act.gov.au until Friday 27 October. The new park in West Basin and its adjacent boardwalk are expected to be opened to the public in early 2018. The nearly 23,000 plants that will be used to transform a new public park in West Basin have been ordered, with about a third being grown locally at the Yarralumla Nursery. The plantings for the creation of the park on the headland next to Commonwealth Avenue Bridge, consist of a large range of ground-cover shrubs and grasses – including the locally endangered Button Wrinkewort - as well as 86 new trees. Both the park and the first section of the new boardwalk are due to open early in 2018. City Renewal Authority chief executive Malcolm Snow said the park was a significant improvement on the previous public space in West Basin. “The new public park at West Basin is a sign of the government’s commitment to providing high-quality open space and public places in the city centre,” Mr Snow said. “Linking in with the boardwalk, the park will provide a new recreational destination so more people can enjoy the beautiful vistas the lake provides. “The mixture of native and exotic trees and plants chosen are robust and climate resilient. They will increase the percentage of vegetation cover and improve the diversity of habitat and biodiversity outcomes,” Mr Snow said. To see the full list of plants ordered for the new park click here. A section of road in West Basin that has been closed for the construction of a new public park will be temporarily reopened as a one-way street from tomorrow until the end of Floriade. The section of Barrine Drive, south of Albert Street in West Basin, will be opened in one direction to allow vehicles to travel from Commonwealth Park into West Basin (see image below). Diversions will be in place to ensure continuous access to both Commonwealth Park and West Basin parking areas. Detour signage will be in place to direct motorists. City Renewal Authority chief executive Malcolm Snow said the road had been temporarily reopened to allow greater access during Floriade and would be closed again following the festival until the park is completed in early 2018. “Floriade is one of the city’s most important festivals, with a large number of locals and visitors using the area each day,” Mr Snow said. When the park is completed Barrine Drive will be a two-way shared zone. While the partial reopening of Barrine Drive will improve traffic conditions, Floriade organisers have emphasised that parking at West Basin and at Commonwealth Park will be limited. Visitors are being urged to use alternative transport options, including public transport and active transport. There are a number of parking options available within walking distance to the venue, including in the city and the Parliamentary Zone. A free shuttle bus will operate throughout the day from various city centre locations. Pedestrian and cyclists will continue to use the signalised Commonwealth Avenue crossing. Road access under Commonwealth Avenue Bridge between West Basin and Commonwealth Park will be closed from Monday 19 June until Friday 8 September to allow for the construction of a new public park. The temporary road closure, to allow work to begin on a waterfront park next to Commonwealth Avenue Bridge at the southern headland of West Basin, has been timed to allow the road to be reopened for Floriade. Barrine Drive will be closed again after Floriade until the park’s completion in early 2018, when it will be reopened as a shared zone. LDA City to the Lake Director Nicholas Holt said both West Basin and Commonwealth Park would remain accessible to users during the closure but some diversions would be in place for drivers looking for access from the opposite sides of Commonwealth Avenue. “While the closure of this section of Barrine Drive is necessary for the construction of a new high-quality public park, we have ensured access to these two important areas will still be available,” Mr Holt said. “We recognise that the diversions in place will be an inconvenience to some people but the delivery of a waterfront park, along with the new public boardwalk in West Basin, will create a fantastic new public space where Canberrans and visitors to enjoy Lake Burley Griffin.